When it comes out the ground, natural gas will be mixed up with other liquid or vapor hydrocarbons and water vapor. 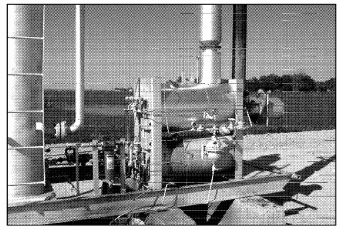 A great deal of the vapor and liquid that is caught up in the natural gas will be removed by high pressure separators. 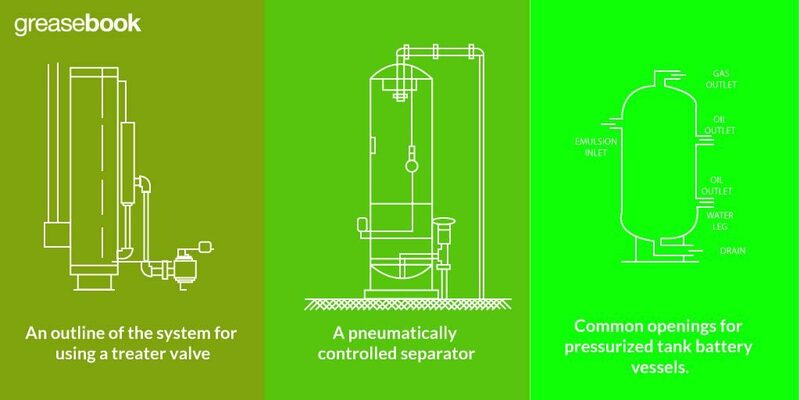 Separators are designed primarily to separate liquid from gas, though three-phase separators will also isolate liquid hydrocarbons from water. Once the natural gas has passed through a separator, however, it may still be fairly wet gas, also known as rich gas. This is gas that still contains vapor, both water and a form of liquid hydrocarbon called distillate, that needs to be removed before it can be sent to the pipeline. 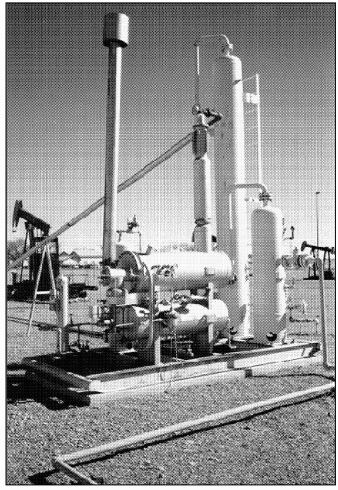 A dehydration unit will often be used to dry natural gas enough for it to be sold. The gas may still contain some vapor, but it will be conditioned so that its dewpoint, the temperature at which condensation forms, is lower. Some types of dehydration units may be referred to as a thermo or stack pack. Figure 1. 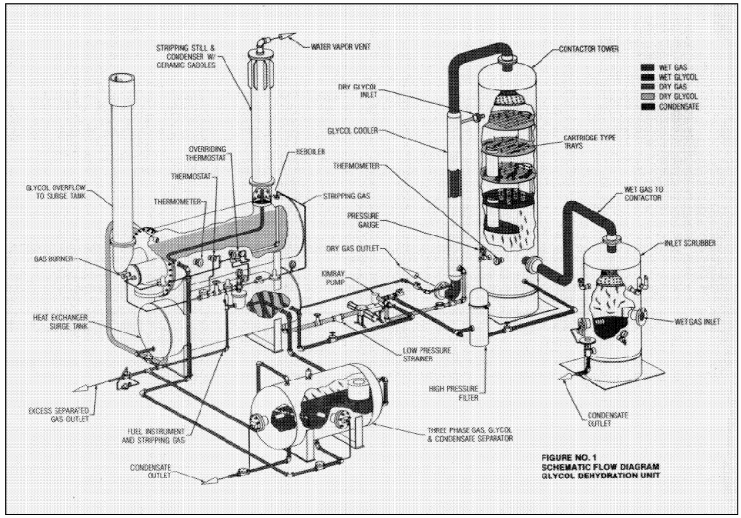 A diagram outlining the operation of a glycol dehydration unit. The gas is treated with a chemical that is hygroscopic, meaning it will absorb the water vapor in the gas. The dry gas is then measured and stored or sold. That chemical is usually either tri-ethylene glycol or ethylene glycol, with tri-ethylene glycol being more common. The dehydration unit will usually be with the separator, located together before the tank battery. Figure 2. Pictured together are a separator and a dehydration unit with knee tub. In the background are tanks for handling water and distillate. A dehydration unit may consist of several different vessels. The first is the inlet scrubber, a two phase vessel which separates liquid from gas. The gas passes over a divertor plate so that it flows in a circular direction. It then passes up through a mesh mist extractor, and then on to the next vessel in the unit, the contact tower. The gas enters the bottom of the contact tower and flows up through a series of trays. The first is called a chimney tray, and is simply a tray that is sealed on the bottom and that has a short length of pipe leading up. This allows the chimney tray to catch glycol as it falls from above. All the trays above the chimney tray will usually be bubble cap trays, each with a layer of glycol that drops down from above and flows out through the downcomers. The trays are metal sheets with dozens of holes in them. Each hole will have a small cap above a riser, so that as gas flows up it is broken up into small bubbles. This increases the surface area that is exposed to the glycol, improving the efficiency of the chemical as it draws liquid vapor from the gas. The gas then passes up out of the top of the tower. Figure 3. A close up of a dehydration unit. The gas then is piped through a downcomer line and passes through the glycol-gas heat exchanger. 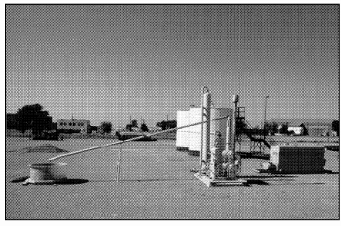 Glycol that is entering the contact tower is usually hot after water has been boiled out; the gas is used to cool the glycol. The gas is then sent on to be measured and compressed. Glycol is pushed through the system by a pump, and is cycled through to be used multiple times. A dual action pump pushes glycol to the top of the contact tower, so that it can flow to the bottom and absorb liquid along the way. The wet glycol collected at the bottom of the tower is pushed through a high pressure strainer and into a surge tank. It is then pushed into a separator designed to remove any gas that may have been brought along, as well as liquid hydrocarbons like condensate. The glycol, still laden with water, is next pumped to the reboiler. The gas reclaimed from the dehydration unit’s separator can be used to power the reboiler. Glycol has a higher boiling point than water, so the glycol can be heated to boil the water off. Boiling temperature will rise or fall depending on pressure and contaminants, but reboilers generally operate at about 350 degrees Fahrenheit. This is significantly higher than water’s boiling point of 212 degrees, but just below glycol’s boiling temperature. Figure 4. An example of a reboiler. Water vapor rises from the glycol and is sent through a stripping still and condenser, after which it flows down an angled pipe to a small container called a foot tub. The angled pipe will most likely need to be insulated, as the water in it can freeze in cold weather and cause a blockage. Figure 5. 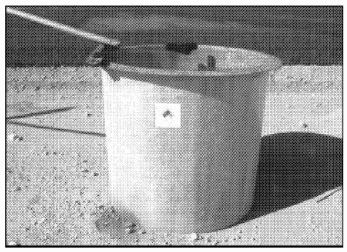 A foot tub from collecting water. Vacuum trucks are used to empty the foot tubs so that they don’t overflow. This is a task that may be performed by the gas purchasing company. The tank batteries for natural gas wells are usually fairly simple. 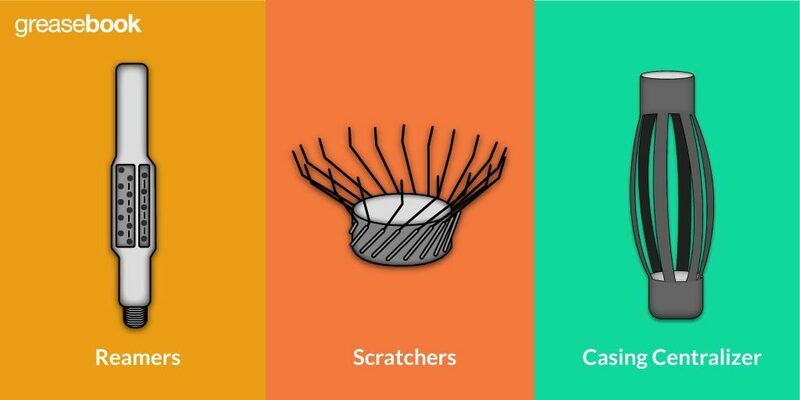 The liquid that is produced is usually made up of low weight hydrocarbons and water, which flash separate without requiring any heat or pressure. As a result, not much equipment is needed; heater-treaters, wash barrels, and other vessels a crude oil tank battery would require can be left out. 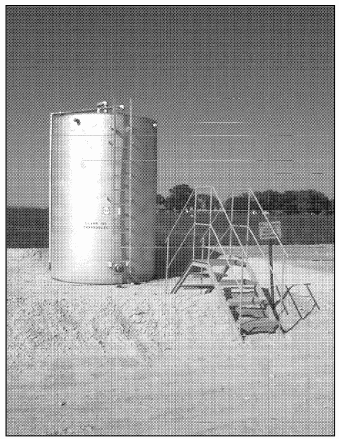 Tank batteries for gas wells do have a few special considerations. In particular, the liquid hydrocarbons that are produced will have a high API gravity, and can act as a penetrating fluid. Fittings that are even a bit loose can lead to seeping leaks. Leaking fluids will stain equipment and the installation, leading to a generally run down appearance. 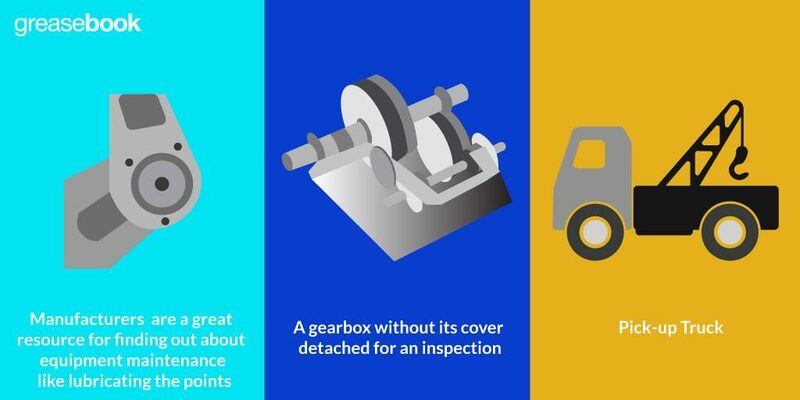 Keeping an installation clean is also about more than just an attractive appearance; when equipment is clean and well maintained it’s much easier to spot problems before they become serious. Figure 6. 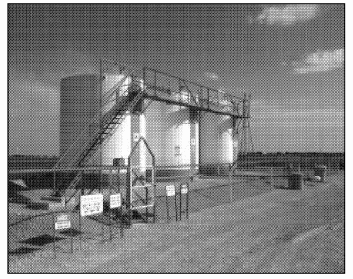 This is an example of a tank battery designed to serve a gas well. 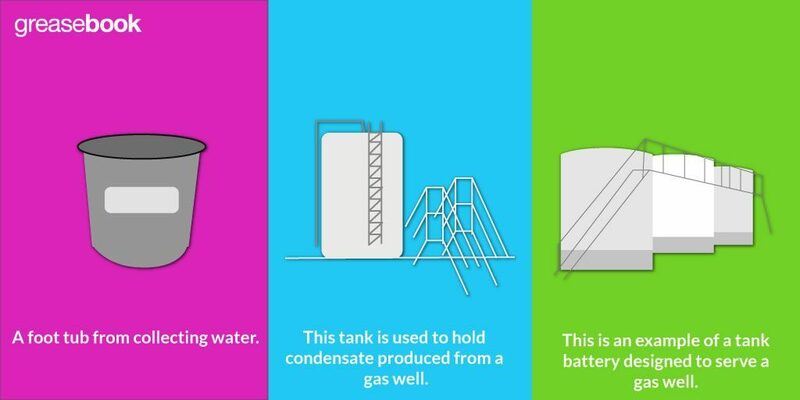 Each well produces a slightly different mix of gas and liquids, so each tank battery will be different to meet specific needs. Beyond the three phase separator and dehydration unit, other vessels will usually include a tank for storing liquid hydrocarbons and a holding tank for the water disposal system. Figure 7. This tank is used to hold condensate produced from a gas well. The tank used for holding liquid hydrocarbons, like condensate, may need to be more than just a simple stock tank. The liquid hydrocarbons can be extremely volatile, meaning that they will evaporate very easily. 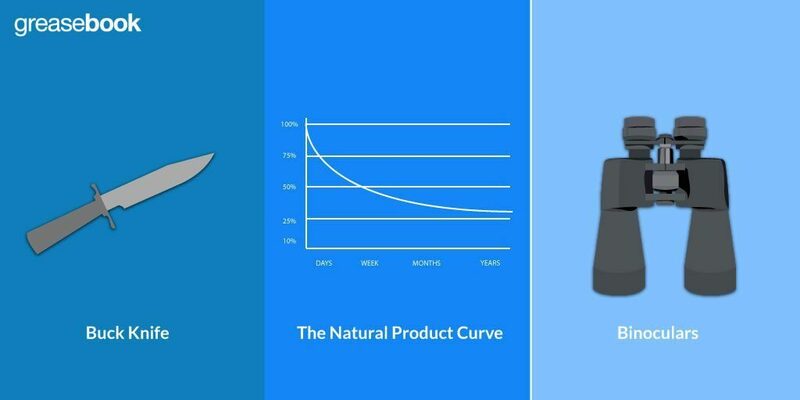 Loss through evaporation can be a significant problem, and so a higher back pressure may need to be held to reduce the evaporation. A careful record will usually show any losses.